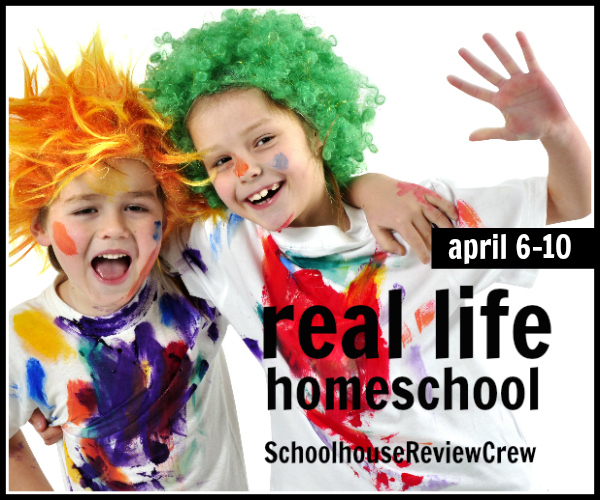 Today is day 3 in the Real Life Homeschooling Blog Hop. I am sharing the second day of our week, Monday. I let AJ sleep in, because I slept in. I ended up sleeping through my alarm which happens a little too often. When I woke up around 9:30 this is what I found. AJ was in the garage eating breakfast and working on some of her independent work for the day! She told me she wanted to get started so that she would have plenty of time to ride her bike. Maybe this new schedule really is working. She ended up reading the Bible stories for both today and tomorrow. This was part of her history work. Next we went on to the Bible Study that we are reviewing. After reading a few verses and discussing them, she attempted to do a crossword puzzle. Unfortunately, the crossword puzzle questions and the answer squares didn’t add up. After a few minutes we decided to have her do the younger version of the crossword puzzle instead. Next on the schedule was Spelling. Today was the dreaded day of dictation. She started out by reading the passage and chunking it. Then we covered the passage and I dictated it to her. She struggles with the dictation because one of the rules is that she can’t erase. If she spells a word wrong she has to cross it out and try again. She also doesn’t like to be timed. The dictation is only suppose to last for ten minutes, but today she was a little distracted and didn’t write very much after 10 minutes so I stopped her after 15 minutes. She did well, but I hope that we can get further along tomorrow when we do the final dictation. After spelling we moved onto Science. Today’s lesson was about how to read a weather map. She read a little bit about weather maps and then had to answer six questions based on them. It was a quick activity that only took about 15 minutes. I let AJ pick the next subject and she chose math. She started with her Key to Percent book and finished her two pages very quickly. Then she decided that she wanted to go ahead and finish off the book today, including the test. This is where we normally get off course with our schedule. She wants to do more in a subject and we end up putting other subjects on hold. Last week we were so focused on history that we didn’t do any science. I told her that she could do as much math as she wanted, but that the other subjects had to get done too. She passed her test with 98% and wanted to start the next book, but I had to stop her there, because I didn’t want to do school work all day. Have I mentioned how much I love Key to Math? Next up was History. She read a few verses in Joshua and then I put on the What in the World? CD for her to listen to while she colored in her What’s in the Bible? coloring book. I have found that she doesn’t pay attention unless she is doing something. She just spaces out and can’t tell me anything that has happened. Sometimes I let her play with play dough, kinetic sand, or putty. But today’s lesson fit in so well with the coloring pages so I had her color. While she was listening to the CD I checked on Grandma and started preparing dinner – chicken and dumplings. She looked at her spread sheet and realized that she forgot to do her A+ Math that we are reviewing. She logged into her account and started on lesson 6. After she did the lesson and got 100% on the after lesson questions, I realized that there were worksheets to go along with the lessons. She hadn’t completed any of the worksheets because I didn’t realize they existed. Oops! I had her do a few of the worksheets that we had missed and then it was time for lunch. Even with doing extra math and history, school was less that 4 hours long. I ended up running a few errands to the pharmacy and the store and then we worked on Star Toaster when I came back. When we were finished she rode her bike for over an hour. It was a very successful day! Here are 10 more amazing bloggers who are participating in the Blog Hop, check them out! 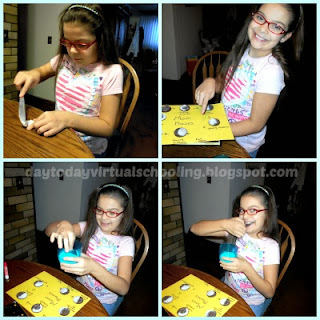 See how others spend their day by checking out A Day in our Homeschool! Science is a favorite subject around here. If AJ had her way we would do science all day. She loves the experiments, the pictures, and learning new things, she doesn’t like all of the reading though. When we were given the opportunity to review an amazing science curriculum from Visual Learning Systems, I was hopeful that it would be the perfect product. I was given a year long subscription for both the Digital Science Online: Elementary Edition Grades K-5 and the Digital Science Online: Secondary Edition Grades 6-12. We looked around the elementary edition, but decided to use the secondary edition. What is Digital Science Online? Digital Science Online is a video based science program created by Visual Learning Systems. It includes videos that can be watched all at once which takes about 20 minutes, or watched in segments that are only a few minutes long. To go along with the videos there are; animations, images and teachers guides. The teachers guides include a copy of the video transcript, learning objectives, student activities, and answer keys. Student activities include a pretest, a video review, post test, vocabulary, and other activities that vary depending on the topic. The Secondary Edition is for grades 6-12 and is broken up into six sections of science; physical science, earth science, life science, integrated science, health, and biology. Each section is then further broken down into topics. The program is completely online and can be accesses from any device with internet capabilities. The teacher guides and student activities are downloadable and need to be printed out to be used. We finished our study on geology right before this science curriculum arrived. We wanted to continue with earth science so we dove right in with the topic of oceanography. I printed off the student activity worksheets and the answer key and then we got started. We don’t test very often, so when AJ saw that there was both a pretest and a post test she was a little nervous. I gave her the pretest and she was overwhelmed. We hadn’t ever studied the oceans before so she didn’t know very many answers. She was frustrated, so we decided to skip the pretests for the rest of the units. Then we watched the videos about oceanography. We watched them straight through. She loved the videos! They were entertaining, and full of information. After the video she filled out the video review worksheet. The next day we watched two of the short videos again and then did a few fun activities. 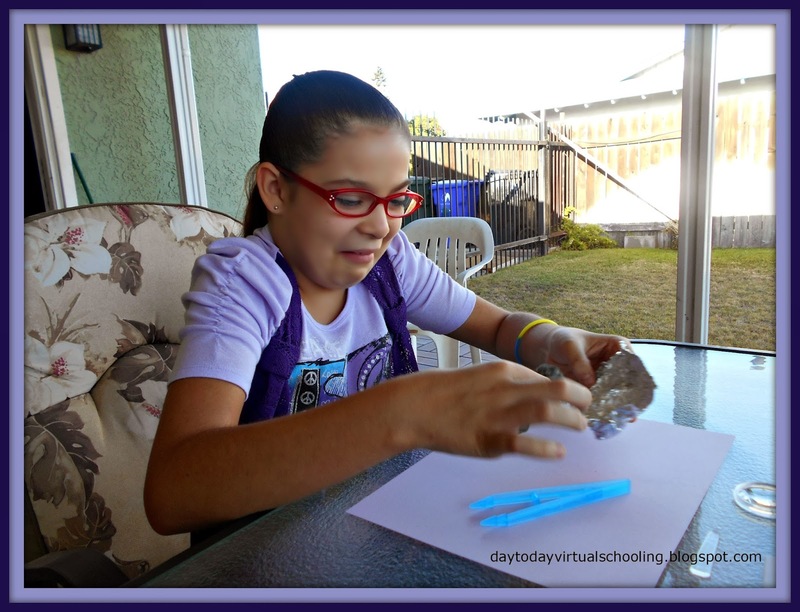 She completed three different science experiments to learn about pressure, salinity and density, and temperature and density. The following day we watched three different short videos again and then did a few experiments about waves. The next week we watched the short video about the ocean floor again. After refreshing her memory she read about the ocean floor and then drew a diagram of it. She finished up the day with a vocabulary worksheet. On the final day of our oceanography study she did a reading comprehension worksheet about ocean animals. Then we went through all of the animations to make sure she remembered all of the key topics. Finally, she took the post test. It was 20 questions, ten true and false questions and ten fill in the blank questions. She aced it! The study was really interesting and in-depth. She had a lot of hands on fun and really seemed to grasp the concepts. After our study on oceanography was over, we continued with the water theme and learned about freshwater. We explored a few other topics including climate, mapping, and atmosphere. Each day was different and each topic had different student activities. Some topics had more hands on activities and others had more worksheets and graphing activities. There is not a set sequence to follow when using this program. You can pick and choose what topic to learn about and even which type of science to study. The program is very easy to navigate, everything is laid out and it is easy to find what you are looking for. There is a student log in where they have access to everything except the teachers guide and then a parent log in. I decided to just use the parent log in since I was doing the lessons with her. Prior to finding Digital Science Online we were just doing lapbooks based on different science topics because I couldn’t find a curriculum that I really liked. I have found one I love now! This was the perfect curriculum for AJ. She learns really well from videos, and instead of supplementing with videos, the majority of the learning is taking place by watching the videos. The videos were well made and the narration was clear and easy to understand. I also love the fact that there is an offline component to the program. It includes some reading and writing, but not too much. AJ found the activities exciting, and I found that she was really retaining the information. The best part is that it is flexible and easy to customize to fit your learning. If you don’t like an activity, you can skip it. Want to add in a few extra science experiments that you found on Pinterest, go ahead. You can also search for a topic. If you are learning about fish and want to learn a little more, you can type “fish” into the search box and it will bring up any videos, animations, or photos on the topic. It really is flexible! There were only two thing that I didn’t care for. First is that it is a secular based program, there are topics on evolution, and almost all of the geology topics talked about the earth being millions of years old. I didn’t find that to be too big of an issue though, it gave us a chance to reinforce why we believe what we believe. Right now the list of science topics are in alphabetical order. I think that if they were grouped by topic instead (geology, weather, astronomy exec) it would be easier to see which topics went together. Overall we love Digital science. We plan to continue to use it for the rest of this year and then next year as well. I do plan to add in a few library books on the topics we are studying just to add in a little bit more reading, but that wouldn’t be necessary. If you have a visual learner or a child who likes to watch videos, this may be the perfect science program for you. Take a look at the sample lessons and see what you think. It is really a good deal, and I would absolutly recommend it. One product, either the elementary (k-5) or secondary level (6-12) , can cover all of your students (up to 8) for a full year of science even if you want them to work on different topics. For homeschoolers the cost is $99. You can connect with Visual Learning Systems on Facebook and Twitter. AJ learns better if she doesn’t have to read about a subject. She can read all about science or history in a book and the information may or may not click. If she can see the information or interact with it in some way it brings learning to life. We were contacted by Standard Deviants Accelerate to do a review, and after looking into their product, I thought it would be a great fit for us. What is Standard Deviants Accelerate? Standard Deviants Accelerate is an online learning system for select subjects for grades 3 to 12. Videos explain/teach the information and then follow up activities are completed online. Currently the subjects offered include the following. The AP classes are only 1 chapter long and while they don’t exactly teach all of the information you need to pass the AP test, they teach how to take the test and then some important information. Topics covered include when you should guess at an answer, what to expect on the test, test taking strategies in general, and the topics you need to know. There is some material covered, but just an overview of the topics. The regular classes are broken into chapters. Most of them have the same structure; a chapter introduction, between three to five lessons on the topics, and then a chapter review. Within each lesson the activities also follow a similar structure. Each lesson starts off with a video. Next to the video there is a copy of the video transcript where you can follow along if you want. Under the video there is a place to take notes on the video. You can even copy and paste information from the transcript directly into your notes. After the video there may be vocabulary. This is simply a screen that lists any new vocabulary from the lesson along with the definitions. The words are clickable, and once they are clicked the word and definition are read to you. Some lessons do not contain a vocabulary section. The next section is the diagram. In this section there may be a list, a matching activity, or a picture where you need to label the parts. There is a word bank at the bottom and the correct answer will stick once it is put in the correct place. Next comes the quiz. The quizzes are about five questions long and are multiple choice. Once the quiz is submitted it is automatically graded and any incorrect answers have a link to the section in the video that explains the correct answer. The final section is the written answer. In this section they are asked a few questions about the “big question” that they are thinking about throughout the chapter. The answers are typed in and the submitted to the teacher (you) for review. You can purchase each class based on your needs. There is a monthly or yearly subscription option. It is accessible 24/7 on your computer, laptop, iPad, or any device with an internet connection. AJ is in 6th grade so unfortunately there were not many classes for her age. We had a choice of Earth Science, Nutrition, Arithmetic, and Fundamental Math. We could have also tried the Algebra or Biology that is for grades 7 and up. She was really beyond most of the chapters in Arithmetic, and Fundamental Math had a few topics she hasn’t mastered. I gave her the choice on which math to use and she wanted to try Algebra. We used algebra as a supplement to her current math program. She hasn’t ever had any algebra prior to this course and while she enjoyed it and learned a lot, she was not quite ready for it. My plan is to go back over some of the things she needs to work on in Fundamental Math and then try the Algebra course again. In my opinion this course would be a great supplement for an algebra course or even a remedial class for someone who needed more information. It wasn’t a good fit for someone who was just learning about algebra. There simply wasn’t enough practice and the pace was too fast. The explanations provided in the video were wonderful but they only showed how to do a few problems and then it was off to the activities and quiz. I saw no retention, and when she was asked to do a problem that was similar to the video she couldn’t figure it out. On the other hand she did learn a lot of vocabulary that I think will help when we do get to algebra later on. We used the chapter on Mountains, Volcanoes, and Earthquakes to finish out our study on geology. This is a secular program so it does refer to millions of years, (and there is a section on evolution in Biology) but I am ok with that. The fact is that a lot of people believe differently from us, so before we try any new science or history AJ and I always talk about our beliefs and why we believe that way. She learned a lot of information from the videos. Some of it was a review of things we had learned earlier in the year, but most was new information. It was great to see the science explained visually. She seemed to retain it and enjoyed watching the videos. I think the main downfall for the science section was the lack of experiments. It is wonderful to see things explained but hands on learning is a lot of fun too. She ended up watching a lot more of the videos just for fun. I love the idea of Standard Deviants Accelerate. The student logs on and there is little involvement needed from the teacher. The videos had a “Bill Nye the Science Guy” feel to them. They are kind of corny, funny, and full of information. I didn’t care for them at first, but they grew on me. AJ loved them from the start and was laughing and learning at the same time. There is a lot of information covered in each video, and taking notes is encouraged. One of AJ’s favorite parts was that there is no physical writing, everything is done on the computer. The lessons are fairly short, an entire lesson usually took about 45 minutes. They can even be broken up into shorter sections if you want. There was a big focus of vocabulary – something we often struggle with. Your work can be saved in your locker and you can go over it at another time when you want to study. It can also be printed out. The final chapter review takes questions that you originally answered incorrectly and asks them again. I love this because if you got it wrong the first time you were suppose to watch that part of the video again and you should be able to get the right answer now. I didn’t like that all of the answers were multiple choice. I think that on the quizzes it would have been nice to have some fill in the blank or matching questions as well. Often some of the choices on the quizzes were obviously incorrect. We didn’t care for the writing section of the chapters at all. We honestly just skipped it. The idea of thinking about a main idea throughout the chapter is good, but we felt discussing the main idea was more than sufficient. There isn’t enough practice in the math sections. There were no hands on learning opportunities. Overall we enjoyed Standard Deviants Accelerate! I plan to have AJ continue to use it to supplement our current courses. If you have a student that learns well visually this may be the answer for you! They are currently offering a free two month trial, so check it out. In Little House in the Big Woods, Mary and Laura were told that people use to think that the moon was made of cheese. That of course prompted a moon study. 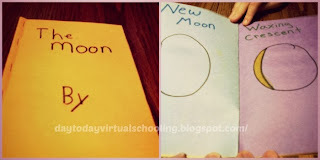 We learned a little bit about the moon phases last year so AJ was excited to learn more. 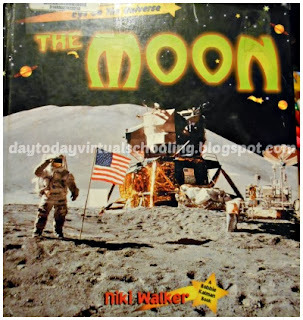 We used the book, Eye on the Universe The Moon. She read everything except for the first few pages that explained how the moon was formed because it didn’t correspond with our beliefs. As we read we stopped and did a few fun experiments along the way. The first thing she did was learned about the landscape of the moon and the craters. 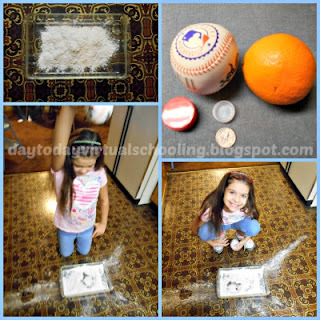 To understand a little bit more about how the craters were formed, we did a simple activity. I filled a cake pan with about an inch of flour. Then using different sized items she dropped them into the flour to see the indents (craters) that were formed. She experimented with heavier and lighter items, and with dropping them from different distances. We talked about why the different size craters were formed and what it would be like to walk on the moon. It was a messy project, but nothing a broom couldn’t fix in a few minutes. She also made a book about the moon. It had pages about gravity, waves, the moon’s landscape, and the phases of the moon. It was a simple book made out of construction paper stapled together, but she had fun making it. I have learned that if I can take the writing that she would normally do in a report or on plain paper and put it into a small book of some type that she not only writes more, but writes with a better attitude. The best part is that she likes to show off her work to other people so she tries to do her best. 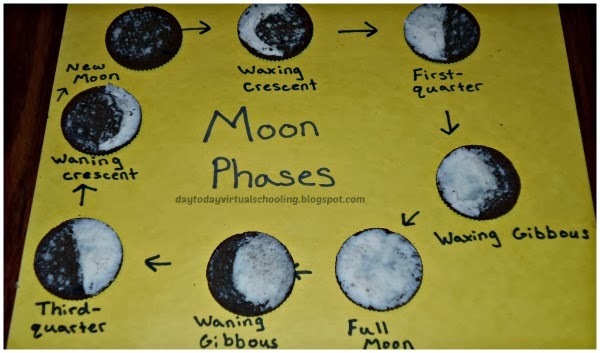 Then we did the moon phase project that is all over Pinterest. I originally saw the idea here, but I have since seen it on a few other blogs as well. 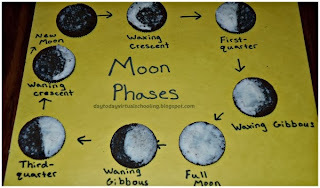 We used chocolate sandwich cookies to show the phases of the moon. AJ had a blast doing this product. I think she had even more fun eating it though. We also watched a few different You Tube about the moon. Since our study about the moon, AJ has been looking at the moon each night and figuring out which phase it is in. She had a great time learning about the moon! In the Little House in the Big Woods, Mary and Laura could only walk around bare foot for a short time after being in shoes all winter. They had to go bare foot a little bit each day and wait until the soft skin on the bottom of their feet had calloused so that they were able to run around with out their feet hurting. This brought on a skin study. AJ learned a little bit about the skin last year so I was looking to do an easy review and to go in to a little more depth. Other than our 2 books we will be using all year, everything that we did I found for free online or made up myself. Here was our study on the skin. First AJ read about the skin in The Young Scientist Book of the Human Body. 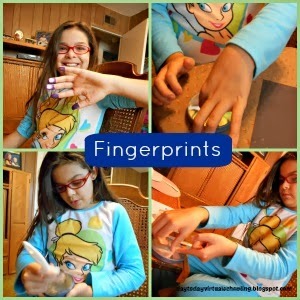 She learned about the parts of the skin, fingerprints, cuts, and more. Then she read a short story from Inspector Bodyguard Patrols the Land of U. This is a fun and informative book that I would recommend to anyone studying the body. The story she read was, The Siege in Toe Print Ridge. It is a cute short story that explains the body’s reaction when you get hurt. After reading a little bit about the skin, I found a FREE file folder game from File Folder Fun. I have seen file folder games all over and thought that AJ would enjoy them, that was not the case. She told me, “It isn’t a game, it is just a worksheet the only difference is I don’t have to write.” You win some you loose some, she did use the file folder game to help her remember the different parts of the skin and then did a worksheet once she knew all of the different parts. If your child enjoys file folder games you should check out their site. I will probably use some of the free worksheets even if I don’t make any more file folder games. When I was a kid the best time in science class was when we were able to watch Bill Nye the Science Guy. I was able to find the episode all about skin on YouTube. 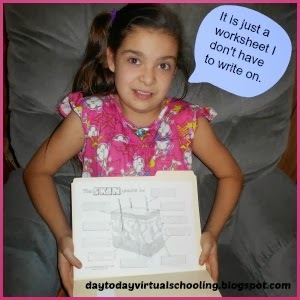 AJ watched it and filled in a free worksheet that I found here. It was a good worksheet but it did not include free answer keys. The questions were easy enough though, that I didn’t feel they were necessary. After reading, watching the video, a file folder game, and a few worksheets, AJ was ready for some hands on learning. We first compared our fingerprints. It was easy! Using a washable marker she colored the tips of her fingers and then pressed them onto white paper. I did the same and she compared the differences using a magnifying glass. We did that a few different times, comparing right and left hands and how the print changed depending on the amount of pressure. Then it was time to play detective! We tried to lift fingerprints off of the mirror on the wall, but had a hard time. We ended up using a small hand held mirror, powder, a brush, tape, and black construction paper. We cleaned the mirror and then put a finger print in the middle. Then she sprinkled powder over the print and used the brush to brush off the extra. After that she took the piece of tape and lifted the print. She placed the print on the black paper and successfully lifted a finger print. It wasn’t perfect, a few times she pressed too hard with the brush and messed up the print. Other times she touched the tape and messed up the print. She got the point and had a lot of fun lifting prints. She tried to compare the prints she lifted to the finger prints she had made on the white paper and learned how hard it could be. AJ learned great deal about the skin and everything we used was either free or something we had on hand. I am really enjoying being able to put these little units together to help AJ learn. One of the neat things that we were able to learn about as part of the Prairie Primer was animal tracks. After searching for a while I found a few free work sheets about animal tracks. The one we ended up using was from Danielle’s Place. There are a few ideas on the page that we didn’t do, but they look like a lot of fun. AJ did a simple worksheet where you match the animals to their tracks but we used it as a learning tool. AJ thought that she knew what type of tracks some of the animals made, but we looked them all up anyways. Some she knew and others she was surprised by. She ended up cutting up the worksheet and gluing it into a mini book about animal tracks. Bear Tracker – This one has a ton of information about animal tracks and has a lot of pictures. EEK – This one has an interactive quiz about animal tracks. 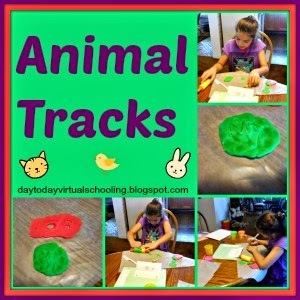 Squidoo – This is an amazing resource that is an entire unit study on animal tracks. After learning all about animal tracks AJ made her own tracks in playdough. She had a lot of fun with this simple activity. She spent quite a while trying to make the tracks just right. Now every where we go she is on the look out for tracks. We are looking forward to a lot more hands on activities to help make learning fun! To go along with our owl study we made owl cookies. I found the idea on Facebook and as soon as I saw it I knew we were going to try it out. You can find the recipe here. Basically you make a large batch of peanut butter cookie dough. Then you take a third of the dough and add coco to it. You put the chocolate dough on top of the regular dough and then roll it into a log. Then you slice the cookies and decorate your owl. You take 2 cookie slices and put them together so that the ends are pushed together and make the face of the owl. Then you use a cashew for the beak, cream cheese for the whites of the eyes, and chocolate chips for the eyes. The cookies turned out very cute, but they didn’t taste very good. To be fair it was the first time I have ever made log cookies and I had a hard time getting the dough to stay together. The dough tasted like it had too much flour in it and they kept falling apart when we were slicing them. I also had to change to recipe to make it corn free. (Baking powder has corn) If I was going to make them again I would just use my own cookie recipe and then decorate them the same way. AJ had a great time making the cookies. I think they made a great end to our study of owls. We recently finished our study on owls. AJ completed a lapbook from Hands of a Child. It was a great study that covered life cycles, anatomy, vocabulary, habitat, migration, and a lot more. This was the first lapbook that I have paid for, and I think it was well worth it. The study was very informative and AJ learned so much. The best part about completing the lapbooks is that AJ loves to show them to everyone and tell them what she has learned. She is already asking when we will do the next one. This is only the second lapbook we she has worked on so we are still learning how to make them even better. The first one she did I had printed everything on white paper so the finished product looked a little bland. This one is way more colorful, but we learned that the dark purple is too hard to read. For the next one we will stick to brighter colors. 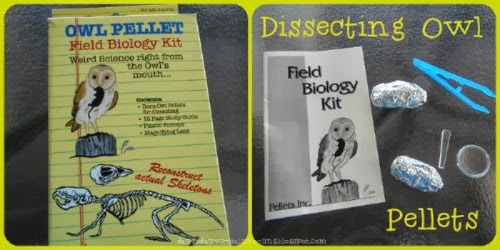 Towards the end of the lapbook there was a lesson that involved dissecting an owl pellet. I had purchased this kit from Rainbow Resource Center at the same time that I purchased our school supplies for the year. At the time I thought it was a good value. It comes with two owl pellets, tweezers, a magnifying glass, and a booklet all about pellets. I was disappointed with the booklet it didn’t give very much information, the tweezers were flimsy, and the magnifying glass was broken when we opened it. If I was going to do this lesson again I would opt for a cheaper set that did not include the booklet. 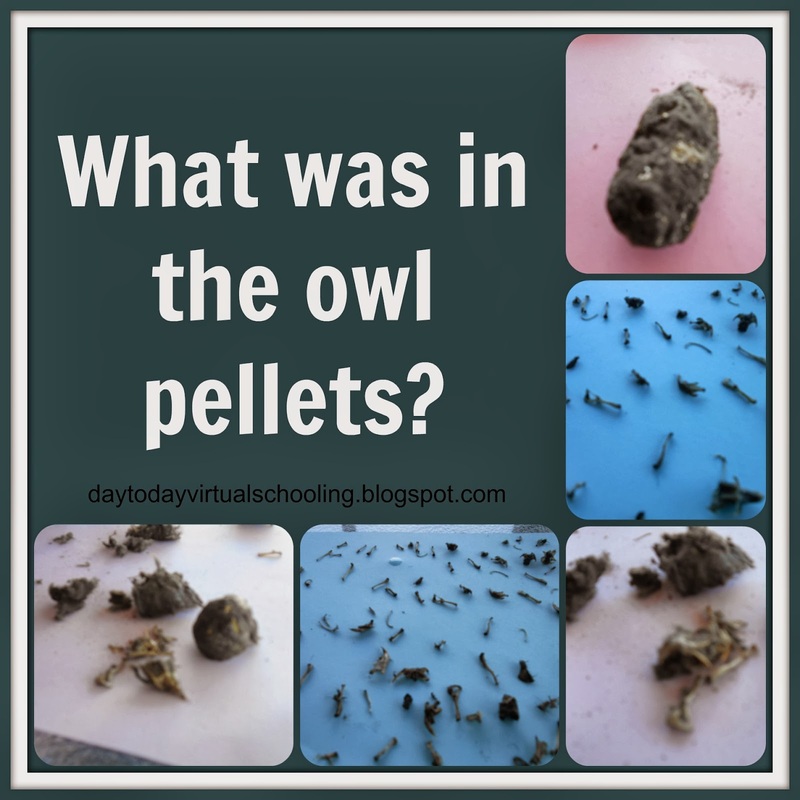 The owl pellets themselves were great though. AJ was excited to start dissecting until she realized that it was a real owl pellet. She thought we were going to dissect a model of a pellet. Her face was priceless. 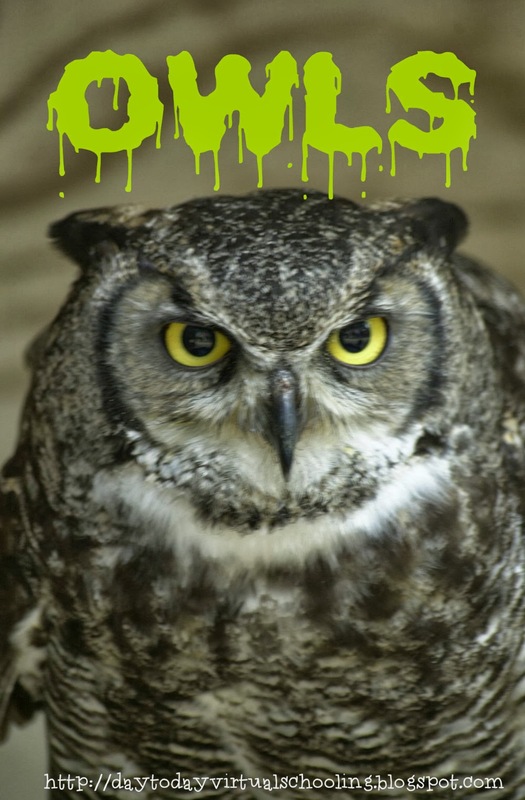 Owls eat a lot of their prey whole, they can’t chew it so the indigestible parts of their prey go to their gizzard. Hours later the bones, fur, feathers and other parts that can’t be digested are coughed up in a pellet. We both learned a lot about owls. In another post I will share the owl cookies we made to finish out our study.